Get announcements of new topics and important updates to existing topics from the City of Decatur in your RSS reader or emailed to you as a daily digest. Subscribe to updates from the City of Decatur, and you'll get emails announcing new topics and the outcome of existing topics. The city is seeking comments on the regulation of e-scooters and e-bikes. Currently, e-scooters are being operated through an Interim Operating Agreement while an ordinance is being developed. We are interested in hearing from you about the key components in the motorized mobiltiy device ordinance. Decatur City Manager Peggy Merriss announced her retirement from the City of Decatur effective December 31, 2018 after 25 years of service as City Manager. The Decatur City Commission hired GovHR to lead the executive search for the City Manager’s position. As part of the process the search firm is seeking community input on the qualities, skills and traits that are important for a new city manager. The information collected from this forum topic will be used by GovHR to develop a recruitment brochure and for selecting possible candidates for the City Commission to consider. This forum topic will be closed at 12:00 p.m. on Friday, September 28, 2018. The City of Decatur’s Revised 2017-2018 and Proposed 2018-2019 budgets have been presented to the City Commission and are available to the public for review. The City’s budget is scheduled to be voted upon by the City Commission on June 18, 2018. Do you support or oppose the adoption of this budget by the City Commission? Decatur will host its second Open Office Hour of the year with Mayor pro tem Tony Powers on Wednesday, May 23 from 7 – 8 p.m. Mayor pro tem Powers will speak for approximately 15-20 minutes on the topic of myths and facts of development in the City. The community is invited to tune in to watch and listen and will be able and encouraged to submit questions related to the topic live via Twitter, Facebook, email or phone. If you already have a question in mind related to this topic area, submit it on Open City Hall now. Decatur will host its first Open Office Hour of the year with Mayor Patti Garrett on Wednesday, May 2 (new date) from 7 – 8 p.m. Mayor Garrett will speak for approximately 15-20 minutes on the topic of tensions between modes of transportation in the City, including the steps the City is taking to improve safety on our streets and sidewalks as well as how to move people, bikes and cars safely and efficiently through Decatur. She will also talk about how the City Commission and staff are addressing the tensions between transportation modes and working with other government agencies such as DeKalb County and the Georgia Department of Transportation. The community is invited to tune in to watch and listen and will be able and encouraged to submit questions related to the topic live via Twitter, Facebook, email or phone. If you already have a question in mind related to this topic area, submit it here now. Please take a moment to answer seven short questions that will help guide the City's way forward on a few initiatives. The 2018 edition of the National Citizen Survey was mailed to 1,500 randomly selected households in the City of Decatur in early February. If you didn’t receive a copy this year but want to share your thoughts on a few questions, here’s your chance. The following questions are specific to Decatur, so let us know what you think by Friday, March 16th by clicking on link below. Decatur will host its sixth and final Open Office Hour of the year with Commissioner Brian Smith on Thursday, October 26 from 7 – 8 p.m. Commissioner Smith will speak for approximately 15-20 minutes on the topic of the role of youth in the City of Decatur. Decatur will host its fifth Open Office Hour with Commissioner Tony Powers on Thursday, September 28 from 7 – 8 p.m. Commissioner Powers will speak for approximately 15-20 minutes on the topic of the role of the city and schools including ongoing and potential initiatives and partnerships. Do you support or oppose the adoption of the revised 2016-2017 and proposed 2017-2018 budgets by the City Commission? The City of Decatur’s Revised 2016-2017 and Proposed 2017-2018 budgets have been presented to the City Commission and are available to the public for review. The City’s budget is scheduled to be voted upon by the City Commission on June 19, 2017. Decatur will host its third Open Office Hour with City Manager Peggy Merriss on Monday, May 22 from 7 – 8 p.m. Ms. Merriss will speak for approximately 15-20 minutes on the topic of the city organization and the budgeting process. 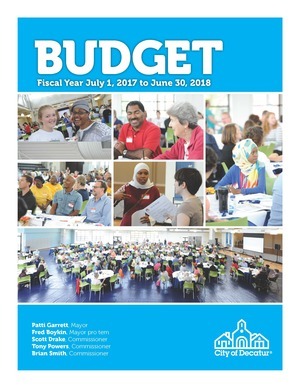 The FY 2017-2018 budget is now available for review and can be found at www.decaturga.com/budget. Decatur will host its second Open Office Hour with Mayor pro tem Fred Boykin on Monday, April 26 from 7 – 8 p.m. The Mayor pro tem will speak for approximately 15-20 minutes on the topic of transportation in the city and the activities and efforts relating to this area. The community is invited to tune in to watch and listen and will be able and encouraged to submit questions related to the topic live via Twitter, Facebook, email or phone. If you already have a question in mind related to this topic area, submit it here now. Beginning this March, the City of Decatur will be hosting a series of virtual Town Hall meetings and we would like to know if and when residents might participate. Do you support or oppose the adoption of the revised 2015-2016 and proposed 2016-2017 budgets by the City Commission? Should Decatur Pass on Glass Recycling? Please take a moment to answer three short questions that will help guide Decatur's way forward on a few initiatives. The National Citizen Survey was mailed to 1,500 randomly selected households in Decatur in early February. If you didn’t participate, here’s your chance to answer the questions specific to Decatur. Let us know what you think by Friday, March 18th. Better Together is Decatur’s effort to address Principle B from 2010’s Strategic Plan, which reads, “Encourage a diverse and engaged community.” Associated with this principle are multiple goals to maintain and encourage all manner of diversity, strengthen our connections, foster greater interaction, and promote a stronger sense of community. What do you think of the 71 proposed action items that emerged to take the form of a Community Action Plan? Do you support or oppose the adoption of the revised 2014-2015 and proposed 2015-2016 budgets by the City Commission? What should be done to meet CSD's expanding enrollment demands? How would you spend $500 to show what's most important to you in Decatur? How do you find out about emergencies? Last week we posted 3 questions about the Unified Development Ordinance (UDO) on Open City Hall. Thank you to everyone who participated and left us their feedback. We’re wrapping up our online polling with questions about how the UDO should handle high performance (green) buildings. The proposed UDO includes new high performance standards for both residential and commercial buildings. The proposal would require some manner of third-party green building certification for new construction or substantial renovations that exceed 50% of a building’s pre-renovation market value. It would also require new construction buildings to achieve higher tightness standards, making them less leaky than Georgia Residential Energy Code currently allows. Go to the city’s Open City Hall page now to learn more and let us know what you think. The questions close Sept. 17 at 11:59 p.m.
Go to the city’s Open City Hall page now to learn more and let us know what you think. The questions close Sept. 14 at 11:59 p.m. The Decatur City Commission voted to adopt a new Tree Conservation Ordinance that will go into effect on July 7, 2014. The purpose of this update is to modernize the current ordinance (which dates back to 1988) and to encourage the conservation of existing tree canopy. The process started in October 2013 and the first draft was completed in January 2014. Revisions to this draft were made based on feedback received from Open City Hall, DecaturNEXT.com, and public comment made at City Commission meetings. The second draft was released on April 8, 2014. Presentations made by city staff to the Decatur City Commission specifically outlined the feedback from the two questions asked on Open City Hall about the ordinance drafts. (See the presentation from May 19 for an example.) Additionally, copies of all comments posted to Open City Hall were provided to each of the Commissioners. Open City Hall provides a valuable resource to the City of Decatur on these types of issues, and we are grateful to those who participated. Do you support or oppose the adoption of the revised 2013-2014 and proposed 2014-2015 budgets by the City Commission?